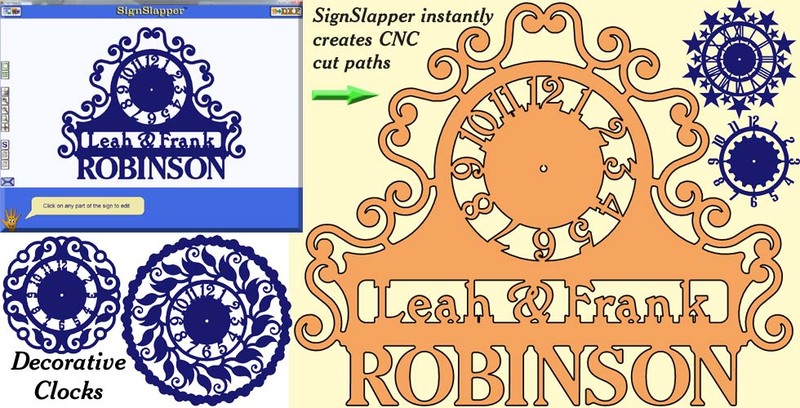 The CNC sign shown above was created in 1 minute - 48 seconds! Use instant arc text effects to make the sign unique! SignSlapper comes standard with over 400 patterns however, additional themes can be added by purchasing any of our CNC art discs. Our art discs include dxf files for your CNC machine as well as SignSlapper ready sign files. Upon installation, our art files from each additional disc are automatically added to your SignSlapper library for your immediate use in the signs. Note: If you have purchased any of our art discs in the past, you will receive all new discs replacing your old ones. The new discs include the dxf files that you already have been using, as well as the SignSlapper-ready files. The art files will automatically appear in your SignSlapper library. SignSlapper has a built-in import tool that allows you to convert image files of clip art, pictures, company logos, etc. After conversion, the pattern is added to your SignSlapper library. Image Note: Not all images are suitable for importing and cutting. Dxf import Note: Not all 3rd party dxf artwork is compatible with SignSlapper (although many are). All art discs from RedPup Productions are guaranteed to work with this program. Includes dozens of handy sign templates. All templates can be edited in seconds and saved as new templates. The SignSlapper sign-building software comes standard with many of ready-to-cut signs including many common information and warning signs that you can cut with your machine. The program also includes many decorative frame patterns (like Grandma's Kitchen shown above), basic name plates, artistic name plates, address sign templates, blank sign templates, quotes or sayings, bases, etc. SignSlapper also includes an assortment art patterns like the designs shown on the top side of the signs shown above. To increase the contents of your art library, you may add any of our art discs at any time. The signs shown above and below are just a small sample of what the program can do. Easily click a button to save signs as an image file to use for website, emailing customers, etc. Move items by dragging with the mouse, or entering numbers, or turning our UnitBox dial wheels, or clicking the increment buttons. Set your default sign width, units of measure, colors, etc. Use the search box to find signs or patterns by name or category. Organize your signs that you offer in folders that you can name. Share your designs with other SignSlapper users. Automatic adding art to other computers or users libraries. *PlasmaCAM, Torchmate, PracticalCNC, DynaTorch, Samson, Trumpf, Vicon, Tracker CNC, Mach2, SolidWorks, AutoCad, CorelDraw, Enroute, SigmaNest, and winCNC are trademarks of their respective companies. We are NOT affilliated with any of these companies. Show your customers their sign in front-view 3D with the click of a button!